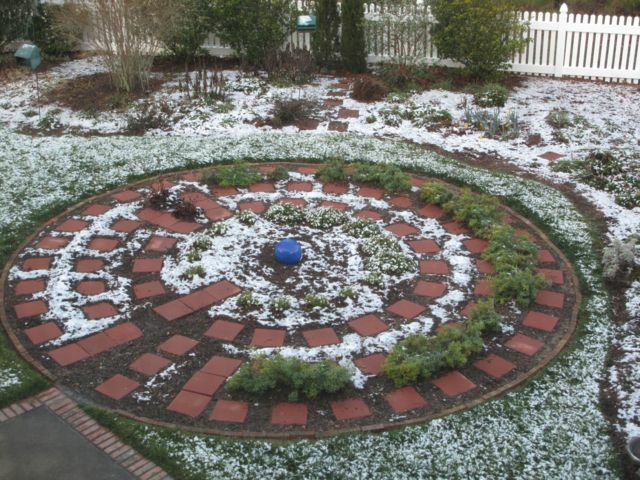 A light snow overnight, the first of the winter, was just enough to give the meditation circle an inaugural white dusting. Only a few birds came around the feeders early this morning, so different from yesterday. Still a variety could be seen: Eastern Bluebird, Northern Cardinal, Red-bellied Woodpecker, Nuthatch, Eastern Towhee, and Grackle. This entry was posted in garden and tagged meditation circle, meditation garden, meditation path, snow, winter garden on February 20, 2012 by pbmgarden.